Topics include: Am I My Sister’s Keeper? ; Cyberbullying; Superficiality; Belief in Oneself; Creating Proper Friendships; Accomplishing Goals; etc. Girl Scouts Speaking Engagement "Who Are You to You?" Learn with Loopiethotamus and 'Dare to Be Hipp-O'!! Loopiethotamus teaches children the importance of building character and values in themselves early on. He also is very devoted to childhood literacy, anti-bullying, and family ideals. Dare to Be 'Honorable'- Show integrity. When you notice someone being treated unfair, help that person by involving a responsible adult. Dare to Be 'Individualistic'- Be yourself. You don't have to follow the crowd. Dare to Be 'Positive'- Have a great attitude about who you are. It all starts with your attitude. Dare to Be 'Purposeful'- Know that you have purpose and what you say and do has purpose. What you do and say affects others as well as yourself. Dare to Be 'Outstanding'- You're fearfully and wonderfully made by God Himself. Show your greatness by being an outstanding person, friend and student. The purpose of Loopiethotamus' value motto 'Dare to Be Hipp-O' is try to make an impact on the children at the preschool and elementary school age level. Children are still impressionable at that age. They have great ability to learn what it means to be an upstanding, dynamic individual. By interacting with the children during author visits, book readings, and workshops, we are empowering and educating children through fulfilling and rewarding activities to believe in themselves, establish proper friendship circles and to know they can achieve any endeavor no matter their circumstance. Loopiethotamus is for the child...the child in all of us. 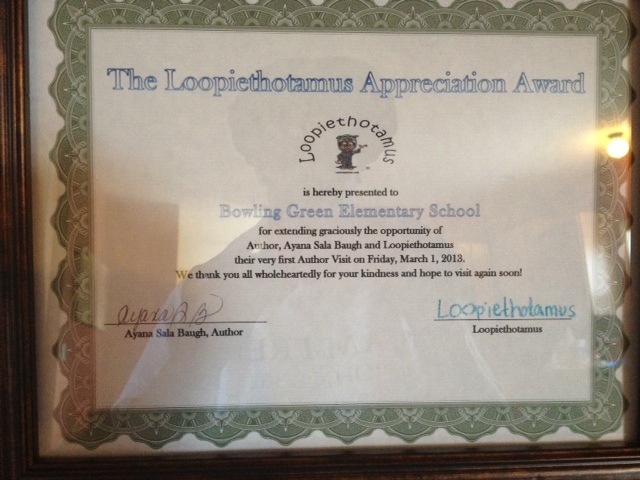 Book a Loopiethotamus Event Today!!! Regina Bynum Alexander - Wonderful message for children concerning bullying. 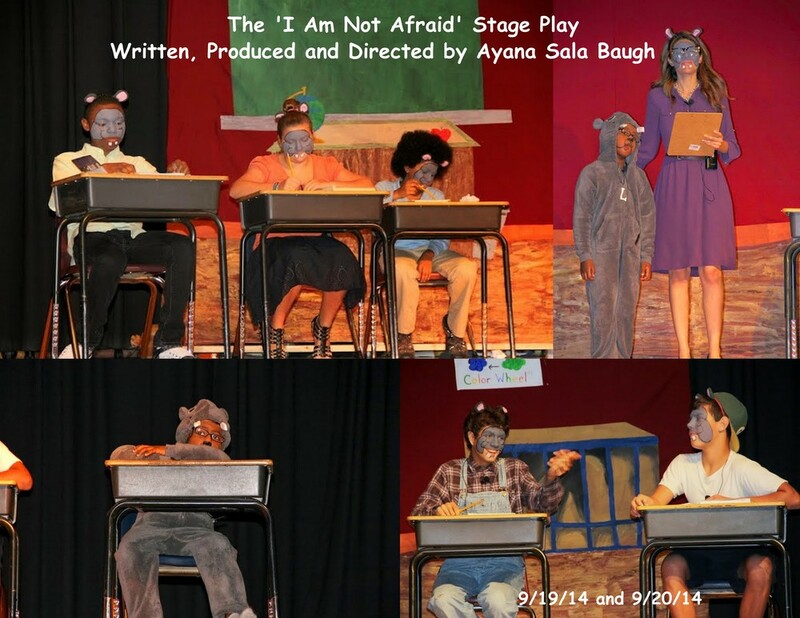 The play gave insight in both the bully, and the victims issues. Great educational and inspirational play for our youth. Great job my sister! Barbara Wilson - It truly was a great play and a must see for all ages. God bless the vision He birthed in Ayana Sala Baugh Author to write the play and bring it to the stage. Denice Johnson Lindsey - Ayana Sala Baugh Author AND EVERYONE THAT WAS INVOLVED IN THIS PLAY WAS TRULY A BLESSING. THE PLAY IS A MUST SEE FOR ALL AGES. MY GIRLS (KEASIA AND ACACIA) WAS BLESSED TO BE DANCERS IN THIS WONDERFUL PLAY. MAY GOD CONTINUE TO BLESS IT. 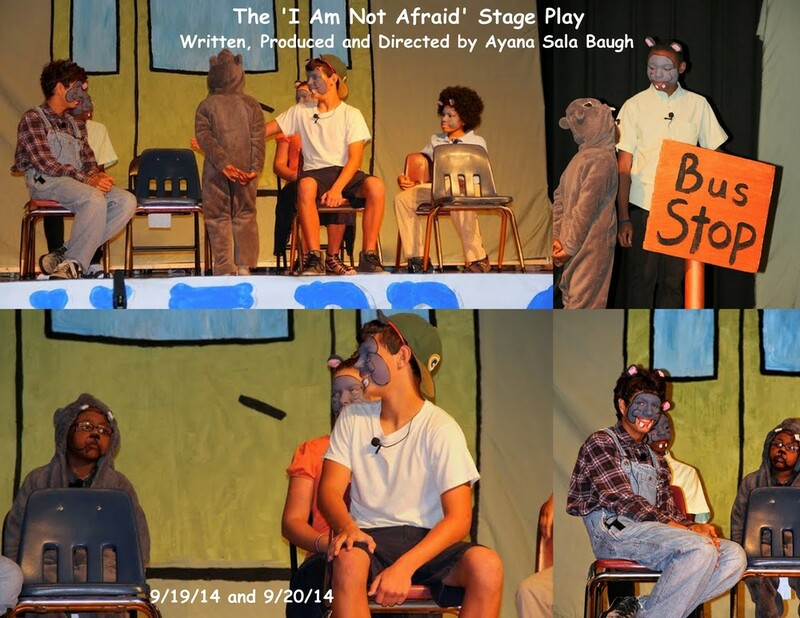 Sylvia Armenta Lipscomb - What a great blessing it was for RCM to host The I Am not Afraid stage play, about bullying. The story line was heartfelt, funny, and sadly so true, today, bullying has gone to a whole different level. I loved watching the anticipation of the audience waiting for the next scene and the audience involvement , we all became a part of the solution to a big problem in helping to stop little bullies from becoming big bullies, hurting people hurt others. This play gives empowerment to those that are experiencing bullying, it's okay to ask for help if you are being bullied or if you are the bully. The cast was great! I highly recommend this play it is a must watch for the whole family and for our schools. Sharon Reynolds Banks - I really enjoyed the play. It was original, creative, and funny. Some of the songs still play in my head..."Loop, Loop, Loop, Loopiethotamus!" Cliff Coward Very Enlightening and we truly enjoyed!!!!! Well, let’s see…I was born on December 5, 1975 in Jamaica, Queens New York. I began writing letters to God and poetry when I was about 13 years old to escape the terrors of domestic violence occurring in my home. Writing allowed me to express all of myself. I was a very shy person around people I didn’t know. However, when I would write, I would let it all out on paper. I began writing poetry, then I moved into short stories. I write for all kinds of genres. Writing is my true passion. My first name “Ayana” means beautiful flower and my middle name “Sala” means loving and tender. When I was a child, I didn’t like my names too much. I guess it’s because kids and teachers would always mispronounce my name and not care that they were doing it. I’m called, “Yanie” by my family. The only time my mom would call me “Ayana” is when I got into trouble. I always got frustrated when I couldn’t find, my first name, at least, on one of those name key chains, mugs or refrigerator magnets. Silly, huh? I even “Googled” my first and middle names together a few times and found absolutely no other person with it. Then I thought to myself, “Hey, I must be something special and maybe my name is supposed to be famous.” That sounds so funny when I think about it. Go figure, my mom told me that initially my first name was going to be “Deidre” and my middle name was going to be “Monique.” She said that the reason she named me “Ayana” was because she used to ride the subway trains in Brooklyn, New York in the 1970’s and she used to see the posters of the “Subway Queens of New York.” One of the Queens’ names was, “Ayana” Williams and she decided “Ayana” would be my name. My middle name was given to me by my mother's cousin. I learned to appreciate my name as I got older. The name given is so important, I think. I am a kid at heart. My first job was as a host of children's parties at McDonald's. I was 16 years old and I remember one of the parents giving me a $20.00 tip my first night out! I wad so elated by that. I can be a bit quirky at times. My husband says I'm loud, but I equate is as my being expressive! I am very social and I enjoy being around people. It makes me feel good to have a nice heart to heart talk with folks. I pray and believe that children, and even adults, will love these books. They are meant to tug at your heart’s strings, encourage values and character building, and give you a warm feeling while and after reading them. I thank God for creating Loopiethotamus for me. Loopiethotamus has a soul and is larger than life! He has so much to teach us. I know you will fall “paws over hoofs” for him like me! Love – My initial vision for my cast is that we become a good family. Good families love no matter what! Good families support and lean on one another; display honesty and constructive criticism in love and respect one another. I approach each cast member with heartfelt love and they in turn do the same with me and their fellow cast mates. Laugh – I truly believe creativity comes through laughter. Being able to express oneself with no real inhibitions. Letting go of insecurities and vulnerabilities. Being open and carefree with one another is what I long for with my cast. It’s refreshing when one can laugh and have a good time while still accomplishing the task at hand. Launch – After all of the rehearsal hours are complete. Time spent studying lines and the characters is done, it is time to launch everything we worked so hard developing. I love the launch stage because now it’s time to share our individual and collective talents and gifts with our audience. It is a special feeling. Loopiethotamus, the Chihuahua Who Thinks He is a Hippopotamus is about a chihuahua who really does believe he is a true hippopotamus. He was left in the meadow by Mama Chihuahua because she could not take care of him. Mama Hippopotamus found him there the next morning and took him home to live with her family. These are very enjoyable, engaging books for your little ones. Loopiethotamus is a character who truly believes in himself. Loopiethotamus has now found himself living with his hippopotamus family. When he was taken home by Mama Hippopotamus in Book 1 he was a little baby. Now his sister and brother are telling him that he doesn't look like them. Loopiethotamus is dealing with the difficulties of not fitting in. However, through Mama Hippopotamus' unconditional love for Loopiethotamus, she comforts him by making him understand that he does look like all of them. She eases his insecurity. Loopiethotamus believes he is a true hippopotamus. "A Loopiethotamus Christmas" tells the story of how happy and excited the main character Loopiethotamus is about his favorite holiday. The story line expresses the joys of Christmas, sharing and the appreciation of a loving family. The beautifully illustrated art work will get your children ready for the holiday season and create a desire to have the story read over and over again. Anyone who reads "A Loopiethotamus Christmas" will smile from ear to ear with pure delight! 'I Am Not Afraid,' tells the story of Loopiethotamus' first and second days of school and how he is bullied by Lyle, the lead bully and his side kicks because of his appearance and unusual name. It shows the emotions that bullying can bring and how Loopiethotamus' family instill bravery and confidence in him. In addition, this books speaks of love, forgiveness, acceptance, friendship, and how it truly takes, "the love of a village to end bullying." 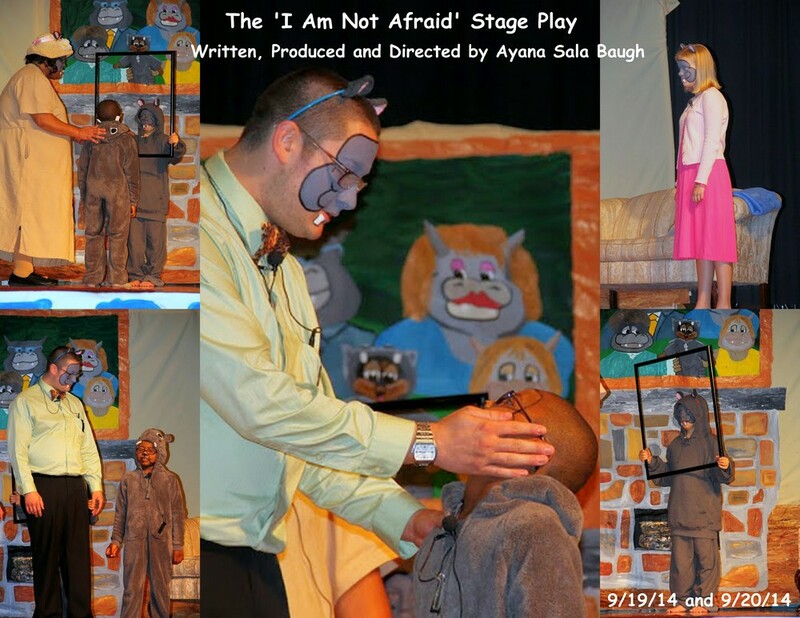 Video testimonial of The 'I Am Not Afraid' Stage Play Script Breakdown Workshop conducted with Madison Elementary (Ruther Glen, VA) 4th Grade Teacher JoWanda Rollins on 5/22/14. 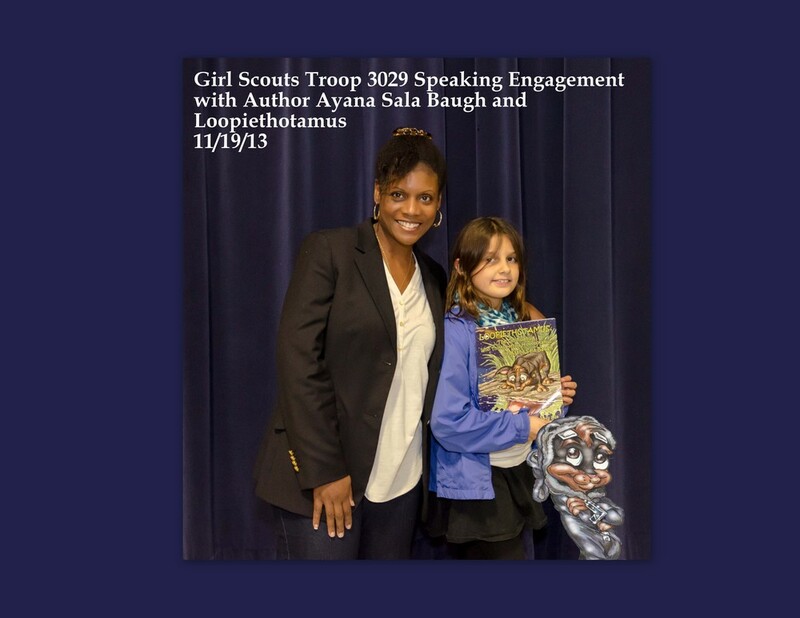 Watch the author visit review from Amy Key, Librarian at Lewis and Clark Elementary in Milford, VA.
Eighteen year Multi-level Girl Scouts Troop Leader Laura Baltz gives a video testimonial on the performance of Author, Ayana Sala Baugh's workshop with the girls. Check out author visit review from Librarian Jill Hupp-Polla of Bowling Green Elementary in Bowling Green, VA!!!! Book Reading and Signing Review of "Loopiethotamus, the Chihuahua Who Thinks He is a Hippopotamus" from manager Elijah Hedrick of Sweet Frog in Carytown Richmond, VA!!! Bowling Green, Virginia educator Jessie Rollins interviews about her experience reading, "Loopiethotamus, the Chihuahua Who Thinks He is a Hippopotamus" Book 1: His Life to students and family members as well as seeing the author in action. Contact the Author for Fees and More Information!